The Customer Survey template for Excel (Customer Survey Dashboard) provides a complete solution for creating customer satisfaction surveys and analyzing results. Survey questions can be defined in a simple table format which then creates a professional questionnaire which can be sent out to customers. Survey results then feed into a dashboard report for analyzing customer satisfaction and management presentation. Survey question can be quickly and easily set up without the requirement to create form controls. Customer survey response results automatically update a detailed report for customer satisfaction analysis and publishing for decision making. The survey analysis report is professionally design with charting for high quality printing and distribution. The survey template and dashboard report can be customized to match company styles and branding. 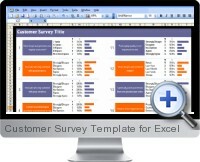 Alternative customer survey template versions included support all versions of Excel.